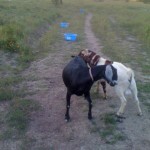 I do intend to get back to talking about horses but the goats have been keeping me very busy lately. My cousin had 5 sets of twins drop in 24 hours and one doe was not doing very well passing her afterbirth. 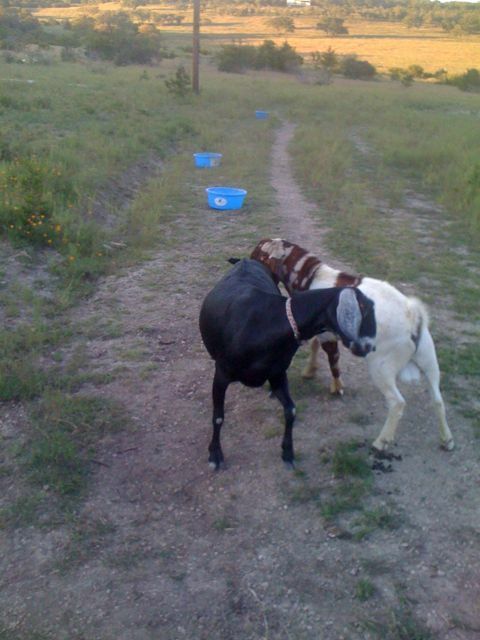 As I was walking back from checking this goat I saw Sally was still in heat and trying to get through the fence to be with my cousin’s young billy. Since it was only Sally and the billy by the gate, I got the bright idea to go ahead and let Sally in the pasture. I somehow had this fantasy that the billy would just breed Sally and then I would let her back into her pasture. Here is what actually happened. Despite the circling, dancing, snorting and singing the baby billy just could not get the job done. Sally stood for him and even got in a hole but the boy fell in the hole and flipped over backwards. He gave it his best shot but eventually got exhausted and Sally got bored and started eating flowers. When I started this little experiment it was only Sally and the billy but with all the excitement the whole herd showed up and pandemonium ensued. As I was debated how I was going to get Sally back in her pasture my friend, David, showed up. He helped me separate her from the others and get her back where she belonged. Since David had his trailer with him we loaded Sally in with his sheep and took her along to go get his billy, Chewy. We unloaded his sheep at his house then went to another pasture and picked up Chewy and 2 more sheep David needed to move to his house. Of course this is all happening in pitch dark. This entry was posted in Other Stuff on October 8, 2010 by Madalyn Ward, DVM.